The Western Australian Academy of Performing Arts is recognised as one of Australia’s most prestigious and comprehensive performing arts academies. Are you reaching out for and beyond imagination? WAAPA’s Post Graduate opportunities may be the answer. Knowledge has many forms, creating many journeys for intrepid adventurers. Fourth year Honours and Graduate Diploma courses enable the refinement of skills and experiences for the rigours of artistic careers ahead. Research Masters and Doctor of Philosophy degrees open doors to specialisation, experimentation and leadership in the performing arts for experienced artists seeking further challenges. Enjoy a rich postgraduate community highlighted by visiting artists and scholars, industry placements, specialist seminars, a high-profile staff and a performance program second to none. Postgraduate studies in music provide a practical based learning and research experience enhanced by the opportunities offered by the multi-disciplined nature of WAAPA and ECU. This one-year course is designed to enable students to excel in one of the following specialisations: classical performance, jazz performance, composition, screen composition, music technology or musicology. 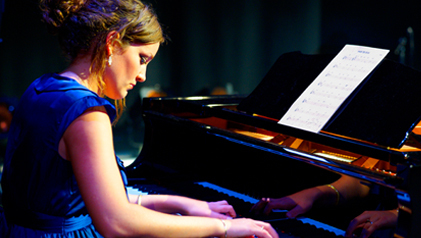 Building on the Bachelor of Music, the Honours qualification strengthens the academic substance of the degree and equips its graduates to pursue post-graduate study. It embraces the latest practice-led research models to facilitate research for performance students as well as more academic areas. Students must demonstrate a course average of at least 70% to be considered for an honours program, and entry is by audition and interview. Honours graduates may go on to the Masters of Music and Doctor of Philosophy (Performing Arts). The Arts Management Honours course consists of a fourth year of study and is offered to students who have completed the Bachelor of Arts (Arts Management) program with a course average of 70% or above. The course is research based and aims to introduce students to the various methodologies associated with the collection, analysis and interpretation of both qualitative and quantitative data, focusing specifically on managerial issues within the arts industry. Through this year, students will gain an appreciation of the art of dance within a broader, interdisciplinary context of the arts and/or sciences and will be able to articulate the significance of the original work they create. The program is offered in two modes: Company research and Individual research. In the Company research mode of intensive investigations into technique and performance, students will expand movement knowledge through diverse choreographic processes; enhance performance skills through exposure to a variety of venues and performance environments; and attain a working knowledge of the logistics of performance and touring in readiness for transition into the dance profession. In the Individual research mode, students will master one or more theoretical approaches to analysing and creating original work in dance practice or scholarly practice; design and implement a research project and present the results of the research in performance and/or other media and in minor thesis/exegesis. The Master of Arts (Performing Arts) is a two-year, full-time Master by Research program for students who have completed an undergraduate degree in the arts. Being practice-based artistic research, the degree involves interwoven components of practice and writing which illuminate disciplinary knowledge in and through the practice. Students research, devise and produce new works of art, develop new approaches to arts practice or alternative connections with other bodies of knowledge. It is expected that these activities will be contemporary expressions of traditional performing arts practice (playwriting, direction, composition, choreography, performance, voice, scenography, technology, production and so on) leading towards new insights in the selected field of study. The work will be exploratory, frequently based around emerging methodologies of arts research, leading to a significant contribution by way of a performance or exhibition outcome or to digital documentation/publication of processes involved in art-making or education. Integral to research through the practices of the performing art/s in question, the student is required to provide an appropriate written contextualisation and/or critical reflection (between 20,000 and 30,000 words) of their research, detailing their interrogative processes and artistic ideas involved in the study. Together, the critical practice and reflection constitute the thesis which is expected to develop appropriate methodologies of inquiry and incorporate current knowledge of the discipline/s through its various modes of transmission. The course is aimed primarily at high level practitioners from a wide cross-section of the arts community who wish to inquire into and/or extend their practice/s in an increasingly multi-art form and technologically-based profession. build upon and extend the traditions and conventions of the student’s earlier training to demonstrate mastery of the knowledge/s of their artistic discipline. If you wish to apply for this course, please visit the Future Students Research web page. The Doctor of Philosophy is a three-year full-time research program aimed primarily at high level practitioners with substantial experience in the arts industry/ profession who aspire towards a more extensive research and creative leadership profile. The course is available in part-time mode in specific circumstances. Although this is a discrete award relating to the performing arts, opportunities exist for cross-disciplinary study. Candidates will be expected to self-initiate and develop research through, in and about the practices of their chosen discipline to produce original and interrogative works of art and/or original approaches to performing arts' processes/products that will extend the knowledge of their discipline/s. The complementary components will normally include a performance, exhibition, event or an embodiment of some form (as in pedagogical investigations) in conjunction with an appropriate written record of the research, detailing reflective processes and artistic ideas in the context of current professional knowledge. In many instances, the research will involve inter-disciplinary elements that bear conceptual implications when framed within performing arts' contexts. Together, the critical practice and reflection constitute the thesis which is expected to demonstrate insight into the myriad avenues of human experience through the singular lenses of artistic practices. Doctoral candidates are seen as articulate leaders in the conceptual underpinnings of their performing arts’ discipline/s.. The Doctor of Philosophy is subject to University-wide regulations pertaining to course duration, formal proposal review and ethics clearance procedures and thesis submission. Copies of the relevant documentation will be provided to all candidates upon enrolment. foster the spirit of interrogation and challenge in the interests of the well-being of the performing arts’ futures. The Practice Transition major is ideal for students who want to build upon current practical skills by exploring an area in more depth. Participants undertake a series of independent, practice based projects alongside research that culminates in a final written exegesis. They develop critical thinking and project management skills that will allow them to transition to the next stage of their career. Where appropriate and by application, students are given recognition of prior learning against the special Skills units and the Supplementary program in recognition of the technical and skill level already acquired through an accredited Advanced Diploma in the performing arts.